I’m very fortunate to work in car sales for a great Audi dealership where I get to drive some truly astonishing cars every day. Despite being associated with the Audi brand for nearly 12 years I genuinely still surprise myself with the quality of our cars, often using a different model of the range for my commute to try them in a real world drive. In addition I’m lucky enough to have a company car which I use for 95% of my motoring. However a great deal of my enthusiasm for cars is for slightly older vehicles hence I’ve usually owned my own car in addition. Both cars have 4.2 litre V8 engines. RS6: Bi-turbo, low (6500 rpm limit) revs, torque monster. 5 gears to the (now) slow witted auto transmission RS4: High revving (8250rpm) lightweight internals, crazily fast 7 speed S-tronic double clutched transmission. Both were labelled as 450ps power. Park the two cars together and their family similarities are clear. Also clear when you see the two cars together is that the RS6 is the same size as the newer RS4. 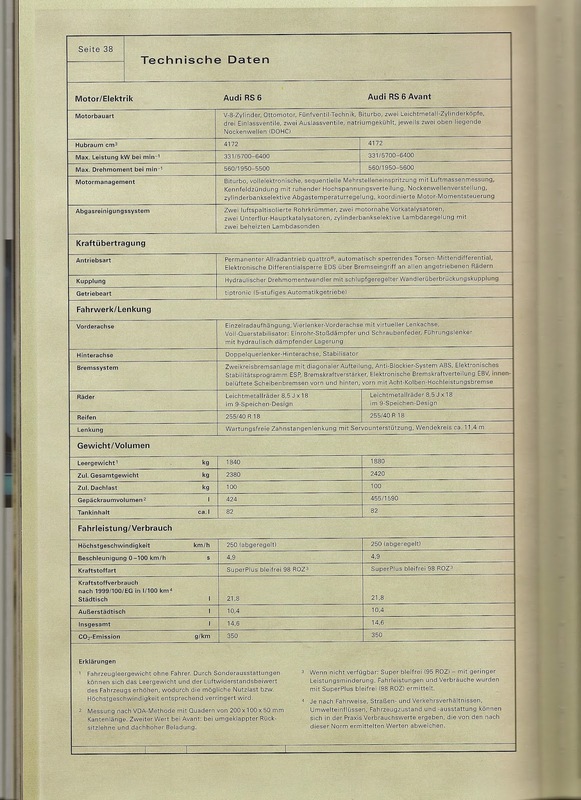 When you look at the attached dimensions and specification you’ll see that their length, width, weight, power and published performance figures are nearly identical. Separated at birth, but by 11 years too. Equal marks on styling for the RS4 and RS6. Hard to separate. Except when you observe how they go about their business. 0-62mph - winner = RS4, That new high revving, sprinting engine with the sharp shifting S-tronic gearbox won’t be beaten here. It will take the strain time and time again. The older transmission I’m almost afraid to admit might crumble under this activity. However - once the cars are at road speed, the tables turn. The RS4 struggles at low revs. Needs to be on-cam. Needs to have its neck wrung. Once the revs are up there and you keep them high it’s a searing soundtrack with it’s valved exhaust open and screaming, like a touring car and nascar sound clip rolled into one. The RS6 on the other hand suddenly becomes the daddy - all barrel-chested brawn and muscle. The V8 Biturbo torque figures don’t lie - 560Nm beats 430Nm no matter which way you view it, and in the RS6 you get that 560NM from 1950-5500 revs. RS4 for the record is 430Nm from 4000 - 6000rpm. The RS6 is well into it’s torque repertoire before the RS4 has really got going. Telling, isn’t it? The RS6 explodes from corners, roundabouts, up hills, from barely above idle speed. The engine and exhaust note rumbling bass with barely contained potency from those low revs, and it’s here, on the road, that the RS4 would truly struggle to keep up. Audi don’t publish 50 - 70mph in gear times, or any other increments for that matter - but they would tell a story here. RS6 wins. 11 years shows. Within a few hundred yards of taking the controls of the newer B8 you can feel that the body shell has much more torsional rigidity. It’s much stronger and more resistant to flexing. And this gives the suspension a better platform to work from. So from the get go the older RS6 feels its age, with body flex, less reaction to helm inputs. It’s a bit like comparing a fit 20 year old runner to me. I could try to keep fit but the newer generation will always be sharper. The new car doesn’t stop there - mine has the standard coil sprung suspension and it’s excellent. My initial thoughts were that it was too hard - but in combination with the standard fitment “quattro Sports differential” (gives active torque vectoring) once the car was run in and on the few sporty drives I’ve had the suspension was just perfect in pressing back at me when I pushed the car. You might recall that my older RS6 has had the Audi DRC removed in favour of a similar coil over set up, but here it cannot keep up. The new car was predictable, agile and nimble with confidence inspiring abilities where the older car was blunt and despite being a loyal old thing it made me “pucker” at high suspension loads and where, perhaps, one was a shade over committed… Scalp one for the RS4. Steering feel in the RS4 is a matter of some debate. My car has the non-dynamic rack and this give the same number of turns lock-to-lock no matter whether the car’s “Drive Select” setting is at Comfort or Dynamic. 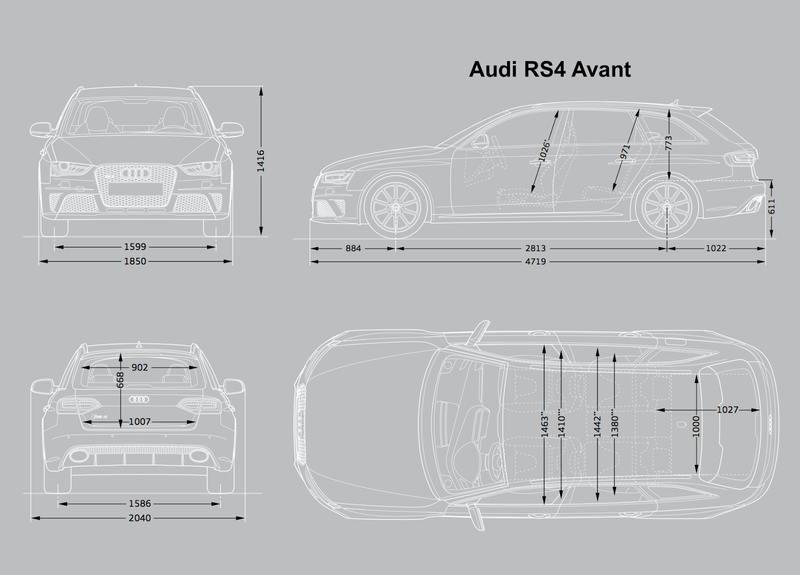 You can specify the RS4 with a “Dynamic steering:” system where the rack has a gearbox attached giving a reduction of turns lock-to-lock, and some don’t like it. I’ve said for a long time that I prefer the power steering’s weight when set to “Comfort” over the artificial feeling “Dynamic”. Setting the “Individual” controls to Engine-dynamic, quattro sports diff- dynamic, steering-comfort, exhaust sound-dynamic, the steering feels uniform in weighting even though its light, and the car is very rewarding to drive. For the record I think Audi could still improve the optional dynamic steering - sometimes it would be nice to have the quicker rack so as not to get too crossed-up in tighter turns, but the feel would need to be natural. The older RS6 also has a “Servotronic” electrically assisted power steering system - but what feel! I often find this is where the car re-establishes itself with my brain as my favourite, when I’ve not driven it for a week or two, and I turn ONE bend on the open road. Steering feel, and no artificial motorised kickback or variability whatsoever. A handling god it ain’t, and the RS4 would eat it on a racetrack challenge, but the C5 RS6 feels so GOOD in comparison. An important equalising point for the old RS6. Here’s a matter close to my heart. I love gadgets. iPhones, and Android phones, connectivity to the web for news, weather and more. Taking my whole music collection with me on what is only a 1 hour drive. Why? I don't know - I just do. I also want the option to play a movie on the dashboard screen. I know it cannot be watched when the car is in motion - but now I know it’s available I also want that. I want to stream Spotify through the Hi-Fi via Bluetooth. And have Google Earth and street view on the Sat Nav. And the new car has this down, along with a very good Bang & Olufsen surround-sound system. It’s noticeably better than the standard music system. Having said that… have you ever tried to listen to your own music collection on your home cinema sound system - it loses something, doesn’t it? 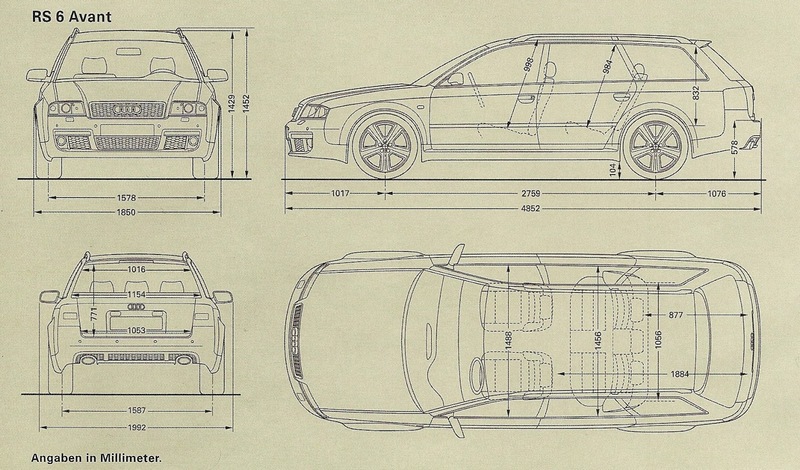 The older RS6 does none of this. It has a 6CD changer. No DAB, and has trouble playing anything digital, unless you format it to MP3 files and load it onto SD card taking care not to add more than 256 files per SD card (note - cannot be SDHC) of 4Gb or less capacity. Try finding those SD cards in the shops! The BOSE Hi-Fi in the old car wins here too - it’s organic sounding, rich and warm and CDs (strangely) sound like an analogue stereo Hi-Fi. This is the way I want to listen to my favourite music. And while I think about it I’d like to do it without my phone, Facebook and Twatter beeping at me while I’m in the middle of the Great Gig in the Sky please, alright? RS6 is in the lead now. Enough space for the family? People, luggage, pets, all fit in each car. But the newer RS4 seems to be shrink wrapped around JUST that essential space. Here the older RS6 scores another one of its victories. The interior cabin space is massive compared to the new RS4 and the boot wider, longer, taller, with a more upright rear window meaning it swallows loads more gear - an able demonstration in the space occupied by all that chassis stiffening, safety cells, airbags, crumple zones, has occupied in newer cars. RS4 is safer no doubt, but RS6 wins on space. The modern features don’t stop there. The interior has the now de-rigour Audi business like appearance. Utter quality, formal styling. Door trims blend into the panels in front and behind. Controls are logically placed. Owners say they didn’t need much time to learn to use it as it’s intuitive. It’s the iPhone of the car world, learn the radio controls and every other on board system uses the same logic. And there’s not much wrong with that. The RS6 is a little more dated but the Audi brand core strengths are here. Think Porsche 991 and 993. Which would you rather have in your garage? Comes down to taste (and budget) and you’ll have a similar arguments with fans of both the modern and air cooled varietals. I’ll try to keep both for the time being thanks!